Today I wanted to share with you the giant flashcards that I made for my studio. They are 8 1/2 by 11" cards, much larger than average. This has many advantages for the studio and classroom use. For the classroom, visibility is the main advantage, but in my studio they have also been a big hit. 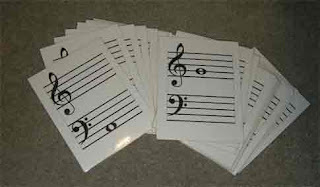 My younger students, when given a choice, will always choose the large cards over the smaller ones that I keep in my music bag. I laminated mine, and printed them on cardstock, so they are very attractive in that manner. Because of their large size, it makes it harder to confuse notes that are close together. It is easy to show the difference between line and space notes. 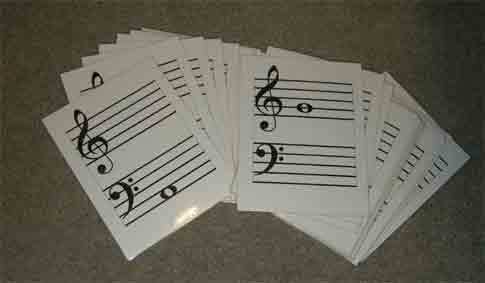 Today I share the treble clef notes, and I will share the bass clef notes next week. Enjoy! This is just what my daughter needs! Thank you! !